The Making of "The Lost World: Tepuis"
The Making of: "The Lost World: Tepuis"
and luxmight harbour life, perhaps even prehistoric life, protected in isolation from exterior forces of evolution. That life on the mountain uriant rain forest below, heading towards an extraordinary flat-topped plateau, rising above the world below, and the cloud layer, like a giant fortress, an island in the sky. Its summit, partially obscured by mist, is dark and forbidding, and its vertical flanks are decorated by waterfalls, falling like delicate threads of gossamer for thousands of feet to the forest below. The mountain is called Roraima, the "Lost World" of prehistoric life made famous in the 19th Century novel by Conan Doyle. It sprawls across the point where Venezuela meets Brazil and Guyana, in northern South America, and, until it was climbed for the first time in 1884, there was speculation among scientists that its vast and ancient summit is indeed unique was confirmed by the first expeditions that eventually reached its elusive summit, but it took almost fifty years of exploration to find a way to climb it. Mount Roraima is just one of over a hundred spectacular tablelands of ancient sandstone that lie in Venezuela, which the local indigenous Pemon people call "Tepuis". Even today, they represent one of the least explored regions of our planet. They are composed of some of the oldest known rocks in the world, laid down in Precambrian times, before life appeared on Earth. I first became interested in this area of South America when, as a young biologist in 1968 and 1969, I was working in a little known area of the Guyana Highlands. I spent the next two years organizing an expedition that, in 1971, took a team of scientists into unexplored territory leading to Roraima's impressive northern prow, an overhanging, sheer rock face. We parachuted in, then spent a month cutting a trail through the forest before climbing a steep knife-edged ridge, where no one had been before us, to the very base of the prow. But we could go no further: the 1,200 feet of overhanging rock between us and the actual summit was beyond our climbing capabilities. Although our expedition had been rich in discoveries of new species, especially of frogs, it was disappointing not to be able to climb the prow, and I determined that one day I would return to stand on that elusive summit. 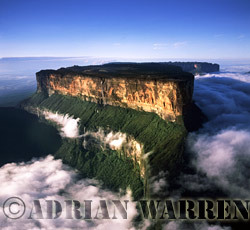 Mainly in pursuit of biological research, a series of other expeditions to the Tepuis followed: in 1974, I climbed Roraima to the summit from the southern side, and also climbed another huge "tepui" to the west called Auyantepui, the source of Angel Falls, the world's highest. 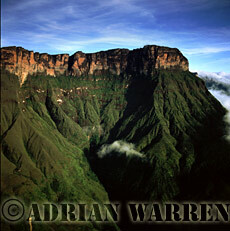 I returned to Auyantepui again in 1976. 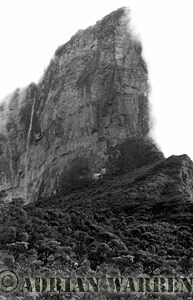 Then, in 1981, I climbed Kukenaam, a huge tepui close to Roraima that had only been climbed for the first time eighteen years earlier, in 1963. 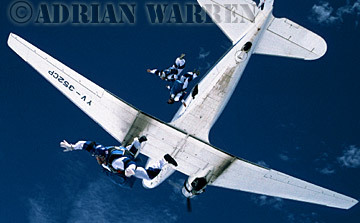 In 1985, I made another international expedition, this time for the BBC, to skydive on to the tiny summit of Autana-tepui, an interesting and spectacular stack of isolated rock far to the west in the Amazonas area of Venezuela. During the course of these expeditions we had discovered yet more new species, and learned a lot about the mysterious, ancient tepuis. In the year 2000 I returned again to make a film following the routes of early explorers who came to this remote part of South America. This time I intended not only to climb Roraima again, but to traverse its summit to reach the northern prow that I had seen from below 29 years earlier. Flying in a small aircraft over the Tepuis gives one a sense of their enormous scale. In order to reach the area requires several hours of flight over luxuriant tropical forest intersected by the meandering courses of many rivers. Then, in the hazy distance, one sees the Tepuis as indistinct rectangular blocks on the horizon. Approaching more closely, the size of the perpendicular walls defies imagination, rising thousands of feet out of the forest, their tops often shrouded by clouds. To have reached such a remote place as Mount Roraima in the nineteenth century must have been a huge undertaking, but expedition followed expedition in an attempt to climb the mysterious plateau, that promised strange and exotic discoveries. The journey in those days took several months to accomplish by canoe and on foot, and the explorers had to carry everything they needed for their long trek. Many turned back before reaching their goal as food supplies dwindled, and others were driven back because of losses through accidents, disease or snakebite. Local Indians feared the mountain, claiming that evil and mischievous spirits lurked there. 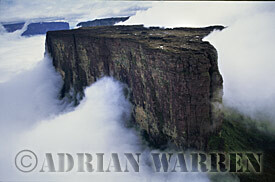 Those who did make it to Roraima were unable to find any obvious route up the precipitous cliffs to the summit. As each expedition failed, the speculation of what might exist on the ancient plateau became ever more tantalizing. The long journeys would start from the coast, navigating upstream along the rivers, using them as highways to pass through the unbroken forest. As they glided silently through the water, propelled only by wooden paddles, they would have encountered some of the exotic wildlife only to be found in tropical South America. Many of the animals may never have seen humans before, so were unafraid. As the travellers penetrated further and further into the interior, the landscape began to change. Waterfalls and rapids blocked their path and the need to portage their canoes became more frequent. 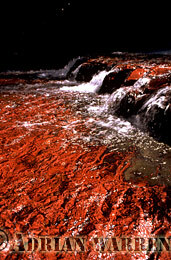 Some of the shallow river beds were composed of a brilliant red jasper, so the tumbling cascades were aflame with colour. Finally, it became impractical to continue by river, and they were forced to take to the forest on foot, laboriously cutting a trail by compass bearing. All contents © 1999-2010 Last Refuge Ltd. All rights reserved.